A car hit a bridge over a railway line earlier, causing train delays and cancellations. 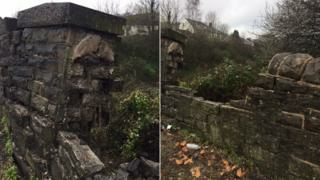 The car damaged and dislodged stone bricks in the crash in Pontypridd, Rhondda Cynon Taff, on Thursday morning. Repairs were completed by about 13:00 GMT, meaning trains between Trefforest and Pontypridd are now running normally. Delays of up to 30 minutes are expected until 14:00 while services catch up.